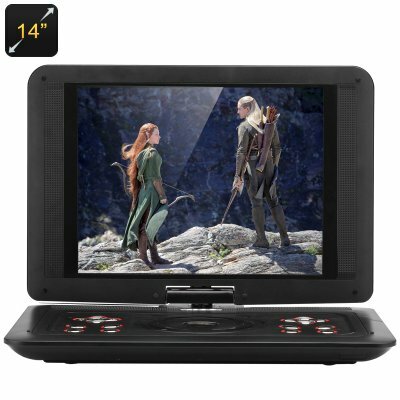 Successfully Added 14 Inch Portable DVD Player - TFT LED Display, 1366x768 Resolution, 270 Degree Rotating Function, SD Card Reader, TV, Games to your Shopping Cart. Whether you are a frequent traveler, a big fan of the movies or are just looking for a reliable and portable entertainment system – you’ve come to the right place. This powerful, yet lightweight DVD player will keep you company in any situation and make sure you are relaxed, entertained and enjoying your leisure time. The portable DVD player comes with a 14 inch TFT LED display, featuring a 4:3 aspect ratio and a resolution of 1366x768. Thus, with the optimal screen size and great image quality, you will be able to have a fulfilling movie experience on the go. To add to your convenience, the screen can be rotated up to 270 degrees, making sure you get the perfect viewing angle – so you can have your movie time sitting at the desk or stretching out on the couch – the screen will follow you. So, what will you be watching? With the portable DVD player, there are multiple options. You can, of course, watch a selection of favorites from your DVD collection or play movies from a USB stick or an SD card, as the player supports both inputs (up to 16GB). However, the DVD player is a multifunctional device, and you can also watch a number of TV stations, play classic games like Mario or Pacman and even read e-books. In the end, you don’t just get a DVD player, but rather a complete multi-purpose entertainment system that can be used for fun and relaxation, as well as reading and learning. This way, it is the perfect material for a gift to give yourself, your family and friends or as a new listing in your own online store. This product is in stock now, we guarantee next working day shipping and offer a 12 months warranty on all our products. Brought to you by the leader in electronic devices as well as wholesale DVD players, Chinavasion..